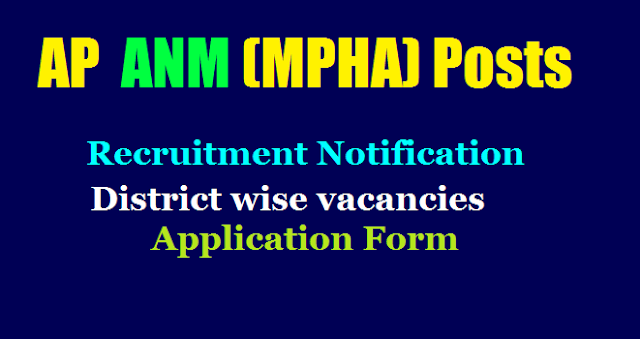 AP 1900 ANM/MPHA Posts Recruitment Notification 2019 District wise vacancies. ANM MPHA Posts Recruitment ANM MPHA Recruitment Notification 1900 ANM Posts Recruitment. ANM/MPHA(F) RECRUITMENT (ON REGULAR BASIS) Notification No.1/2019 Government of Andhra Pradesh Health Medical and family Welware Department inviting Applications from qualified and eligible persons for the Recruitment of MPHA on Regular basis to work in Health Sub Centre in the State of AP. Download Application Form for the Recruitment of ANM/ MPHA 1900 Vacancies in Health Department of Andhra Pradesh. AP ANM/MPHA District wise Vacancies, Qualifications, Age, Salary, Reservation, Selection Procedure, Fee, Application Form and more details here. B) Must have passed EITHER 18 / 24 months MPHA(F) course conducted in the State (recognized by AP Nursing & Midwives Council) OR Two Years lntermediate Vocational Multi Purpose Health Worker (Female) Course and have completed one year Clinical Training in selected Government Hospital. Maximum age limit is 42 years as on 01.02.2019; and age relaxation as per rules' in the case of MPHA (F) already working on contract basis the weightage will be allowed. 2.The Applicants have to submit their applications to the respective DM & HOs in the districts on any working day between 10.30 am to 5.00 pm from 02/02/2019. Each application must be accompanied by D.D. worth Rs.300/- (Rupees three hundred only) payable at Vijayawada drawn in favor of Commissioner of Health & Family Welfare, AP, Gollapudi, Vijayawada. The SC, ST, BC and Ex-service men are exempted from Payment of fee. Rule of reservation applicable as per rules in vogue. Note: Applications sent to the O/o Commissioner of Health & Family welfare, AP shall be rejected without any notice. Copy of the latest Caste Certificate in case of SC/ST/BC (with categorization if any) issued by MRO concerned. In the absence of proper certificates the candidate will be considered as OC only. Andhra Pradesh Government Health Department 1900 ANM MPHA Vacancies Application form for ANM MPHA Recruitment Notification 1900 ANM Posts Recruitment, District Wise Vacancies/ Andhra Pradesh ANM Posts / AP ANM MPHA Recruitment Notification Download Application Form , Eligibility Qualifications fee details at Commissionerate of Health Family Welfare official website http://cfw.ap.nic.in/ .